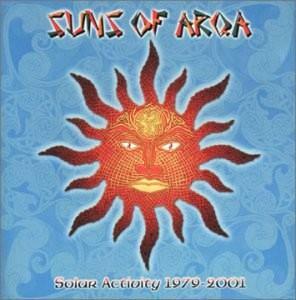 Suns of Arqa - "Solar Activity 1979-2001"
Suns of Arqa, the UK music collective lead by Michael Wadada, sounds a lot like many other trippy techno/trance/ethnic/dub bands out there these days such as Loop Guru and Transglobal Underground. The difference is, Suns of Arqa were doing this kind of music before anyone else was doing it. Over the course of 22 years, some 200 members have passed through the collective, contributing their ideas and their cultures to an ever growing sound that has not only captivated listeners, but influenced numerous other artists. Unfortunately, as is often the case with such a seminal group, their music has always been more difficult to find than those who have followed in their footsteps. Why this often seems to be the case, I'm not exactly sure. Thankfully, EMI decided to gather songs from their earliest days to the present, and put them together into a beautiful, psychedelically packaged double CD. At last, the music of Suns of Arqa is available to the masses. Unfortunately, it may be a little late. Like I said, there are a lot of bands out there that sound like this now. If you've even brushed up alongside the electronica or UK festi-scenes, you will have heard them. Still, listening to Suns of Arqa now, there is a certain magic to their sound that sets them apart from other similar groups. Michael Wadada and his collaborators are the best at what they do, and it shows in the most basic way possible-in the brilliant quality of the music they record. Trance out to the laidback drones and raga rhythms of Cosmic Jugalbandi, sway to the cosmic vibe of Govinda's Dream, groove to the funky flow of Inca Man, float in bliss to the sound of the angelic voices on Paradism in Dub, trip out to the Eastern drone drenched cover of Tomorrow Never Knows, dance to the wild jig of Astralasia's remix of Sully's Reel, or drift into nostalgia with Deep Journey (featuring the unforgettable voice of Professor Stanley Unwin, whose narration on The Small Faces' The Tale of Happiness Stan helped to make it a psychedelic classic). There is plenty here to discover and enjoy.